Surely, between Papadiamantis and Freud there is no special relationship, although they were almost contemporaries. Papadiamantis lived between 1851-1911 and Freud between 1856-1939. Papadiamantis was a novelist and ethographist who presents the people of tradition, and Freud was an Austrian neurologist, the founder of Psychoanalysis, who presented the internal conflicts of people, but also the role of the unconscious and repression "as an expression of mental disorders". Papadiamantis is akin to Dostoevsky, who critiqued western Psychology. Yannis Tsarouchis, the known painter, who studied under Photios Kontoglou, said the following about Papadiamantis: "With two or three religious fanatics and illiterate old people of his island he destroyed Freud" (Eleutherotypia, 01/21/2011). The person in Freud is occupied with himself, his feelings, his experiences, his subconscious, which he attempts to harness on his own, without much help from others or from God. He deals with beasts located in the cave of the unconscious, as Freud would claim. First he needs to discover them then he needs to tame them. This is a difficult task and most of the time people fall into despair and hopelessness. They feel like a bullfighter in the arena being chased by bulls, while the people sit off to the side and monitor without being able to offer assistance. The person in Papadiamantis is influenced by the hesychastic and neptic tradition of his land, he has been raised on the worship of his Church and adoration of his saints, and has a deep communal and spiritual subconscious by which he draws strength. In other words, he is not simply a person with an individual subconscious, but his mental/psychic energies are sick, and he has lost his relationship with God and man. 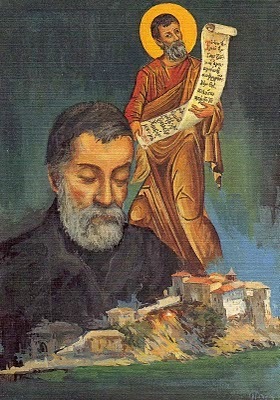 And when he has a problem, even a psychological one, he flees to the mysteries of the Church, to Her worship, to Her vigils, to Her chapels, to chant the "Pepoikilmeni", to sing "the songs of God", or in the worst case he will go to places where he meets other people to satisfy his internal yearnings. Essentially these are two types and two traditions. One is an Anglo-Saxon type of person that expresses the western tradition, and the other is a Romaic type of person who expresses the eastern tradition. All the achievements of modern psychology, psychoanalysis and psychotherapy come from the western tradition, which has in mind the individual and human selfishness, closed in on himself, but in our land we have an "indigenous psychology", which is related to God, to worship, to the saints, the so-called "social soul" or the so-called "social unconscious". It is for this reason that the saying of Yannis Tsarouchis has value: "With two or three religious fanatics and illiterate old people of his island he destroyed Freud." I suppose that with the word "religious fanatic" (θρησκόληπτα) he means "religious" (θρησκευόμενα). These are people who live within the worship and atmosphere of the Church and are exempt from psychological problems, that is, they have no need for Freud's psychoanalysis. Therefore, read Papadiamantis so that you will be healed. Odysseus Elytis said: "Wherever you find evil, brethren, wherever your mind becomes clouded, recall Dionysios Solomos and recall Alexandros Papadiamandis." Source: Ekklesiastiki Paremvasi, "Παπαδιαμάντης καί Φρόϋντ", April 2012. Translated by John Sanidopoulos.